Calcium carbonate, a kind of inorganic compound, is main constituent of limestone and calcite. As an important inorganic chemical product, superfine calcium carbonate is widely used as fillers in rubber, plastic, paper, paint, toothpaste because it takes advantages of low-cost and wide raw material sources. Accounting for 60% of fillers, about 11 million tons of superfine calcium carbonate will be used in producing paper every year. Besides, there is 1.5 million tons of superfine calcium carbonate will be used in manufacturing plastics. Well, what’ s the equipment you can choose for processing calcium carbonate? In fact, there are different choices according to the requirements of output size. MTW European Trapezium Mill made by Liming Heavy Industry has advantages of excellent performance, less energy loss and higher efficiency. And there is an Inner automatic Thin-oil lubricating system which makes the plant more reliable and advanced. Humanized design, simple operation and environmental protection, MTW European Trapezium Mill has became ideal equipment specialized in calcium carbonate processing depending on numerous advantages. 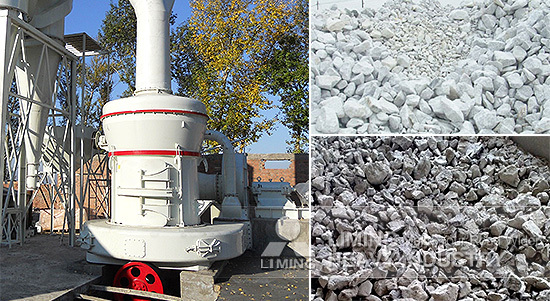 Beside calcium carbonate, MTW European Trapezium Mill also applies to the materials such as limestone, calcite, barite, dolomite, potassium feldspar, bentonite, rock phosphate, etc. If you want to get more details, please contact us!